So this post is for all my ladies out there rocking their baby hair and Afros! 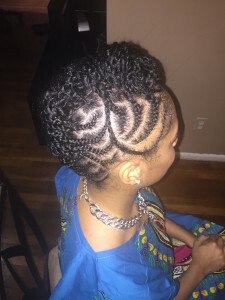 Usually in the natural hair community once we return natural, you forgo the salon visits. Your routine and products become DIY, but don’t you miss someone else doing your hair, and being pampered? I’ll do you one better, how about a licensed natural hair stylist coming to your home and doing your hair? Yes ladies, you read that right, thats what the Tresse Noire Experience is all about. 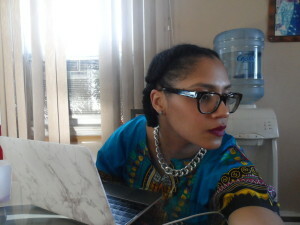 I was fortunate enough to have Tresse Noire stylist Onica, come and bless my strands with a chic mohawk undo. I was tired of my hair, and wanted a protective style to give me at least a week of not having to deal with my fro. You are asked to post a picture of your “style inspiration”, on the Tresse Noire site before the stylist comes out. In addition you can upload a current picture of your natural hair. I immediately felt a vibe with Onica once we ended our phone conversation, and I wasn’t disappointed when she came. Onica was super professional, we had so much in common, and she was abreast of all the natural hair trends. Not to mention, she was super fast at styling my hair. (My hair was washed and detangled prior to her coming.) Follow her on Instagram @thesuperbeauty! 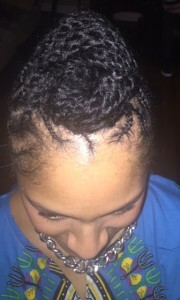 I was more than pleased with my Tresse Noire Experience and would recommend you ladies get familiar! Follow them on Instagram and Twitter @tressenoire. Be sure to like their Facebook page as well to stay updated.